$60.00 | 30 ml / 1 fl. oz. Containing Retinoic Acid, the Gold-standard in anti-aging skincare known for its skin transforming properties to plump wrinkles and treat age spots, sun damage and rough skin. This power-house serum is also loaded with peptides to boost collagen and elastin production and provide a protective barrier to prevent the formation of new wrinkles. Suitable for all skin types. Palmitoyl Tetrapeptide-7 – This short chain amino-acid polymer suppresses production of chemical messengers that cause inflammation and collagen damage, leading to less damaged skin and a more youthful appearance. How do I use Vita A with peptides? Pump a dime size amount for application to entire face and throat. Allow to dry 5 minutes before application of other topicals. This product is best used at night time as part of an anti-aging regimen. Can also be used to assist with an acne regimen. Vitamin A can cause sun sensitivity. Always wear sunscreen while using this product. Switching from one skincare prodcut to another always worries me a bit because my skin is normally pretty good, but something new can send me into a T-zone acne break-out that takes weeks to toally calm down and recover from. Lisa recommended Vita A after my skin consult and HydraFacial and I’ve been really happy with it. It is not greasy or wet in the morning and still seems allow my skin to “glow through”. I haven’t been on it long enough to see full benefits, but will definitely stick with it as my skin feels good, looks good, and I don’t see a return of the fine lines. I have been a constant purveyor of Vita A serum. I feel everyone can tolerate daily use for cellular turnover. Usually within a month there is a notable difference in the skin texture and tone. Vita A Serum is a game changer! It has made my skin softer and plumps wrinkles. Making a noticeable change in my appearance. 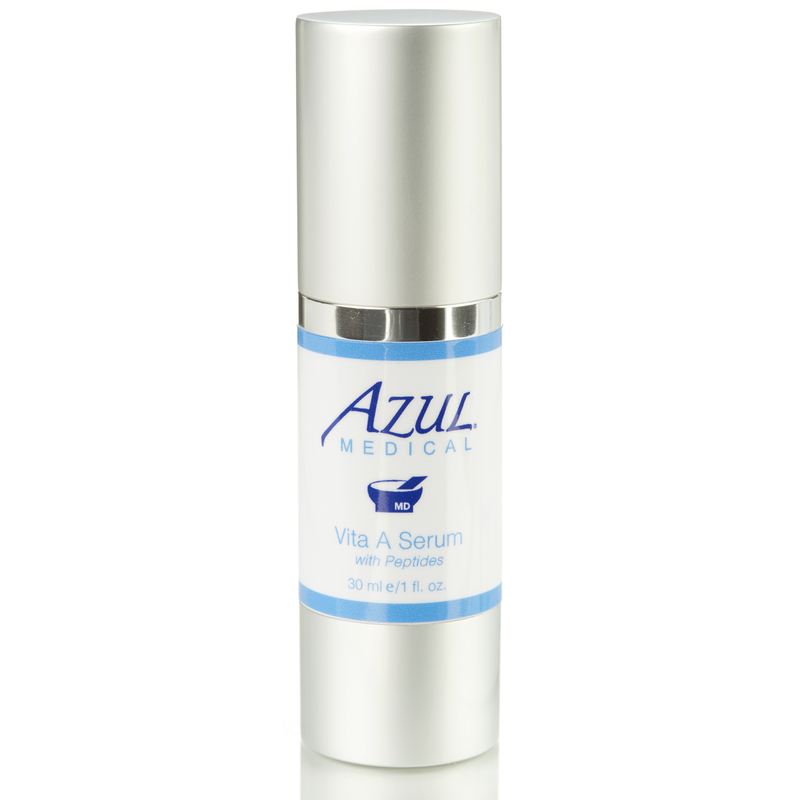 Since starting my journey with Azul SkinHealth products I feel refreshed and can see a change in my appearance. The proof is in the comments I receive from friends and family. They want to know what I’m doing. I hear – “there’s something different about you”. Haven’t had a breakout since beginning the use of this product. Love the results for cell renewal! It has been a life saver for my face specifically under my chin with the lovely “cats tongue” that likes to appear when I accidentally break my routine. This is the only ting to keep my pores under my chin clear and free!